ASIYA® has the mission of enabling sports participation and physical activity while upholding religious and cultural beliefs. We believe everyone should be able to live healthy, active lives, and maintain modest dress in the process. 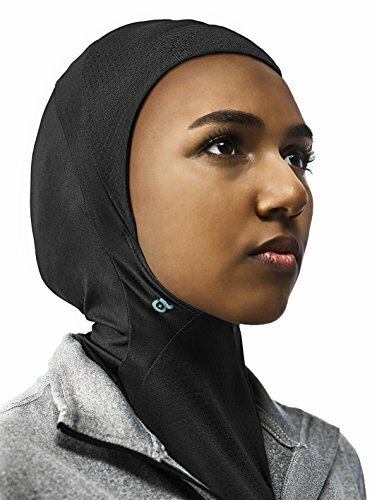 Our ASIYA Sport style sports hijab is designed to stay in-place while keeping you cool, comfortable, and confident. Made with ultra-lightweight and soft ASIYA®Cool Technology Fabric, for ultimate sweat-wicking performance & breath-ability -- so you can perform your best, and stay cool! ASIYA is a Muslim-owned, woman-owned business and proud to be Made in the U.S.A., and all of our designs were created by Muslim girls and women just like you. So go ahead, live your best life out loud, and #playproud! Ultra-lightweight and soft ASIYA®Cool Technology Fabric, for ultimate sweat-wicking performance & breath-ability. You stay cool and dry, even when playing or working your hardest! Pull-on style (no need for pins) and designed to tuck-in to your shirt or uniform top, to be out of the way and safe. Mesh fabric along forehead and neck for extra comfort and breath-ability. Comes in One Size Fits All or Youth Size (under age of 10). If you have any questions about this product by ASIYA, contact us by completing and submitting the form below. If you are looking for a specif part number, please include it with your message.